Halloween Candy Cookie Cake and BOO Kits! I couldn’t wait any longer to start using Halloween candy! This is a fun post because not only am I sharing that delicious Halloween Candy Cookie Cake up there but I’m also showing you how to make a BOO Kit to surprise your friends, neighbors, co-workers, whoever! 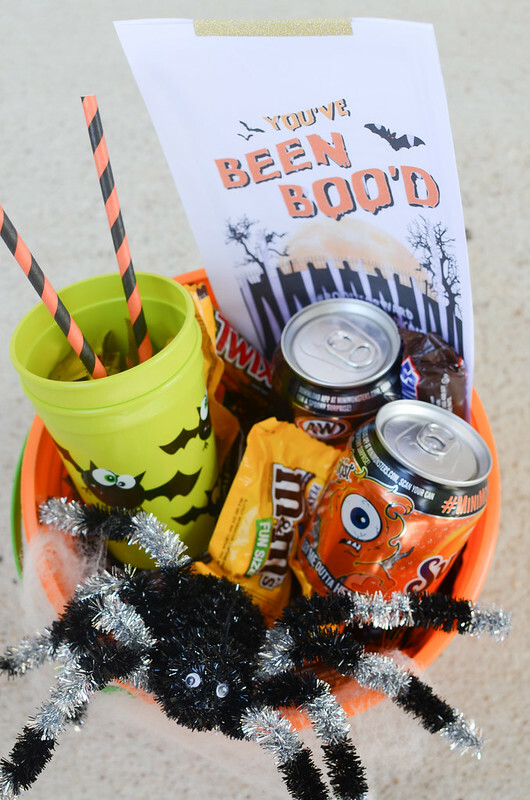 So if you’ve never heard of a BOO Kit, it’s just a fun way to share some treats with the people you care about. 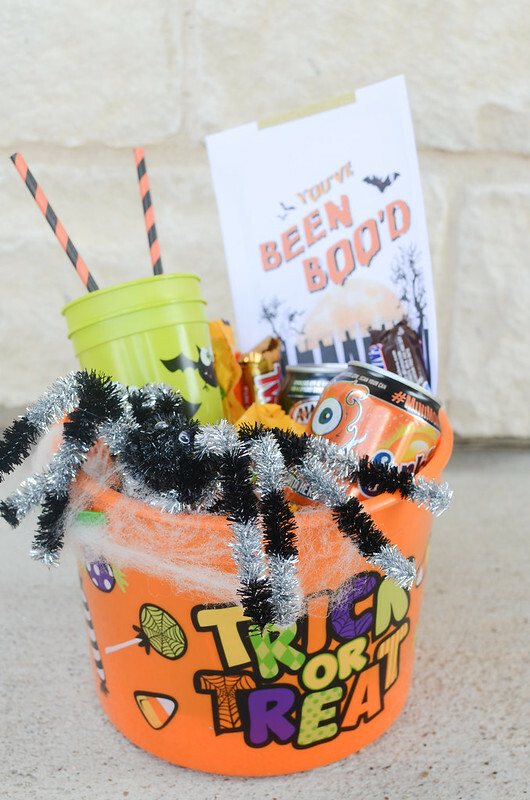 You fill up a cute bucket with candy, creepy Halloween goodies, and top it off with a You’ve Been BOO’d! sign. For my BOO Kit, I went with fun size M&M’s®, SNICKERS®, and TWIX®. And tiny cans of Sunkist® and A&W Rootbeer – they have the cutest monsters on the cans right now! I also added a couple cute Halloween cups, some orange and black paper straws, and a creepy spider in a web. I got all the supplies at Walmart. 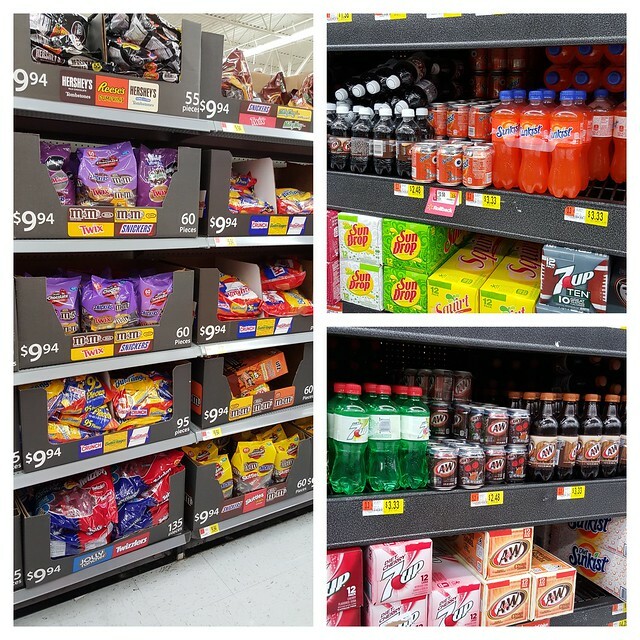 They have a huge aisle of Halloween candy right now and you can find the cute Halloween soda in the regular soda aisle. If you love the You’ve Been BOO’d sign, you can print that here. You can also Save $1.00 on TWO (2) 2L or 6pk 8oz cans of any flavor Sunkist® Soda, 7UP®, Canada Dry®, A&W®, Squirt®, or Sun Drop® with this coupon! And if by some weird chance you have leftover Halloween candy, you should chop it up and turn it into this delicious Halloween Candy Cookie Cake. 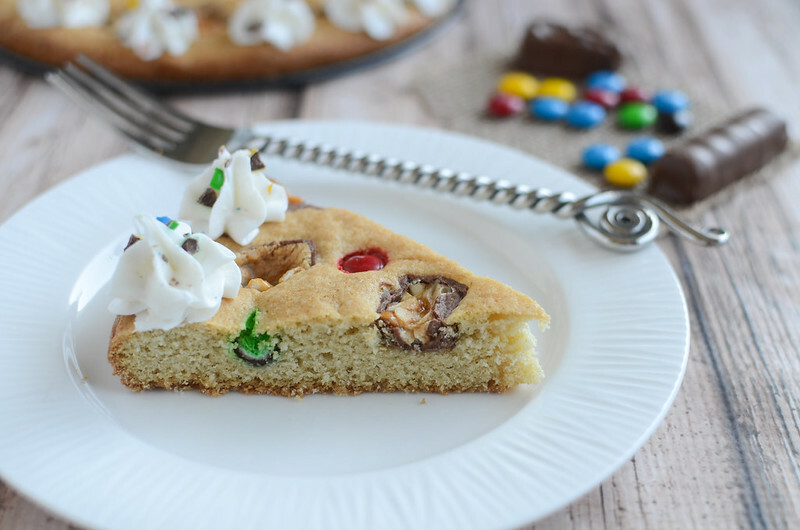 I took my chocolate chip cookie cake recipes, left out the chocolate chips, and pressed M&M’s®, SNICKERS®, and TWIX® on the top before baking. I added some frosting and chopped M&M’s® on top after it was cooled but feel free to skip that step! It’s really delicious. 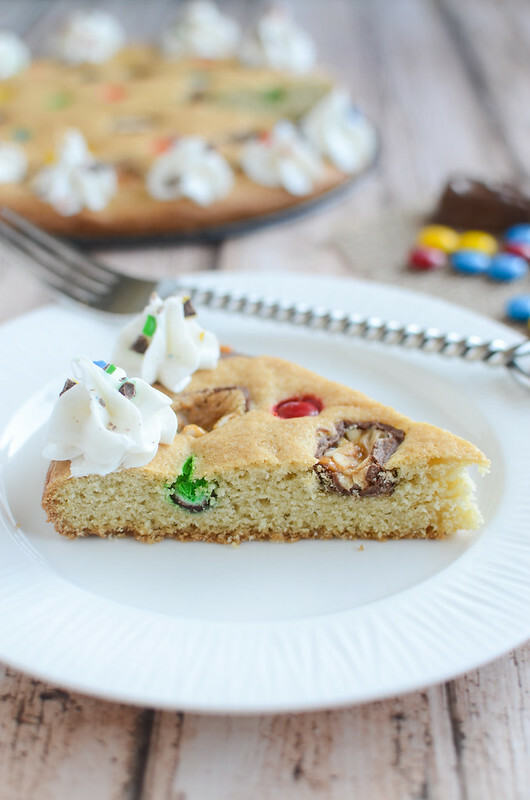 You can’t go wrong with a giant cookie with candy in it! Preheat oven to 375F. Spray a large round pizza pan with baking spray. flour, baking soda and salt in small bowl. Beat butter, granulated sugar, brown sugar and vanilla extract in large mixer bowl until creamy. Add eggs, one at a time, beating well after each addition. Gradually beat in flour mixture. Transfer the dough to the prepared pan and spread to the sides. Press the candies into the top. Bake about 20 minutes or until golden brown and a toothpick inserted into the center comes out clean. Cool completely before cutting and serving. 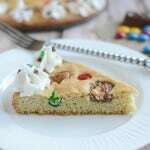 3 Responses to "Halloween Candy Cookie Cake and BOO Kits!" I remember the first year our house got boo’ed, I was like “ugh.” But then the next year, we didn’t, and I was like “oh man, bummer!” We’ve been boo’ed and have been the boo’er ever since. I love Halloween!